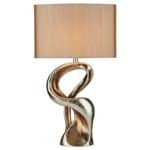 Table Lamps Range at Thompsons Lighting & Interiors, Larne, Co. Antrim, Northern Ireland. Buy table lamps online & in-store. Delivery throughout the UK. 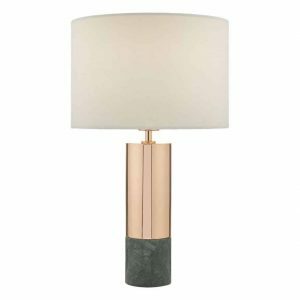 The ALCHEMY 1lt Table Lamp features a hand cast resin base with hand applied gold foil finish and a gold faux silk drum shade. 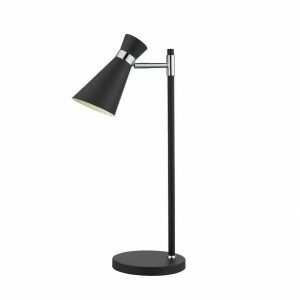 The table lamp is in line rocker switched. 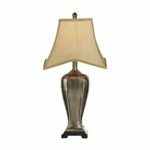 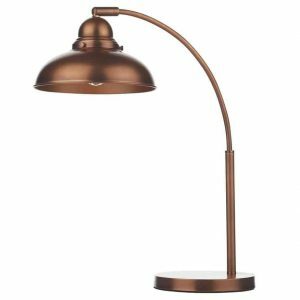 This Bellis II antique brass table lamp with clear glass shade and leaf decoration looks beautiful on any bedroom, living room or dining room table. 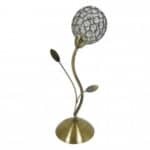 The ornate lamp has a round flower head shade made from antique brass finish hoops and glass buttons, which looks stunning and creates an elegant lighting effect. 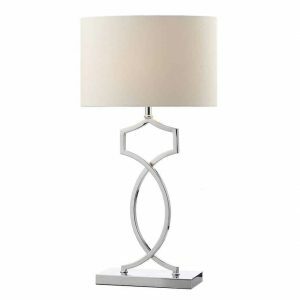 This Bellis II chrome table lamp with clear glass shade and leaf decoration looks beautiful on any bedroom, living room or dining room table. The ornate lamp has a round flower head shade made from chrome finish hoops and glass buttons, which looks stunning and creates an elegant lighting effect. 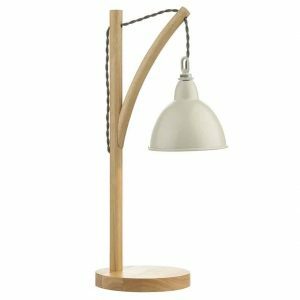 The BLYTON 1lt Table Lamp features a lightwood frame and a metal retro-styled shade in cream. The table lamp is in line rocker switched and has braided cable. 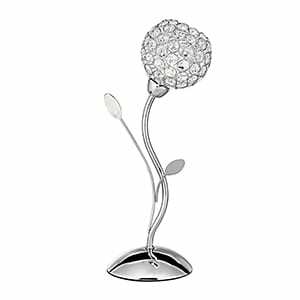 Matching products are available; type BLYTON in the search box at the top of the screen to view the whole range. 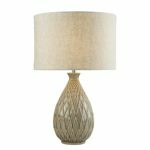 The LAYER Small 1lt Table Lamp has a hand finished artichoke design, distressed cream base and wooden plinth. 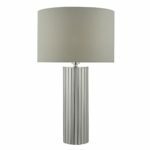 The table lamp comes complete with a fine cotton stone coloured pleated empire shade and is in line rocker switched. 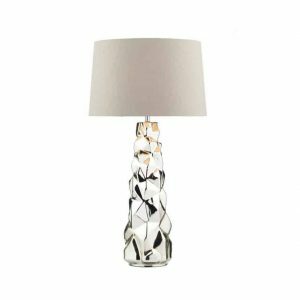 CASSANDRA a substantial table lamp made up of individual pieces of highly polished chrome plated strips creating an eye catching faceted effect. 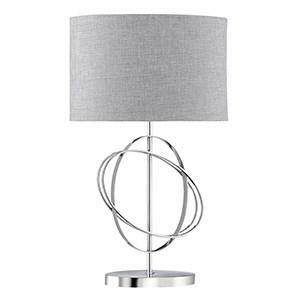 Wired with grey cloth covered cable with an inline rocker switch. 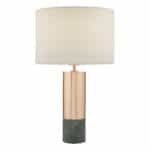 Completed with a grey cotton shade. 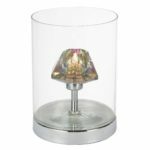 The DECADE Touch Table lamp has a dichroic glass inner shade and a clear glass outer surround. The DONOVAN 1lt Table lamp has a polished chrome frame, cream faux silk drum shade and is in line rocker switched. The EMLYN 1lt Table Lamp features a distressed silver and gold base on a black plinth and comes complete with a faux silk gold bound edge shade which has a harp frame and finial. 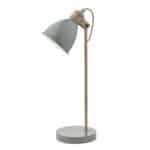 The table lamp is in line rocker switched. 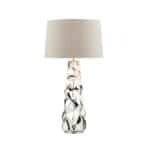 The GUISEPPE Table Lamp has a silvered glass base with feature raised relief pattern and comes complete with a taupe faux silk tapered shade. 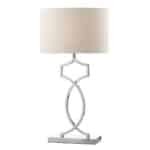 The table lamp is in line rocker switched.